“Racist” 12 Years a Slave Italian poster? That's Brad Pitt – instead of lead Chiwetel Ejiofor – in Steve McQueen's 12 anni schiavo. But is this poster truly racist, as social media hysteria would have us believe, or merely another instance of lack of truth in advertising? Along with David O. Russell's American Hustle and Alfonso Cuarón's Gravity, 12 Years a Slave is one of the top contenders for the 2014 Best Picture Academy Award. In the period drama based on real-life events, Ejiofor stars as a free-born black man who is kidnapped and sold into slavery in the mid-19th century United States, being forced to work for 12 years in a Louisiana plantation. '12 Years a Slave': Racist Italian posters? As 2013 comes to a close, shoo-in Best Picture Academy Award contender 12 Years a Slave has become embroiled in some healthy, Oscar-friendly controversy. Reason for the social media-engendered outrage: A couple of Italian posters for the film have focused on its white supporting players, Brad Pitt and Michael Fassbender, instead of black protagonist Chiwetel Ejiofor (Dirty Pretty Things, Inside Man). Italian distributor BIM has issued contrite apologies. The U.S. media and their cohorts elsewhere have gone on pushing hot buttons – much to the delight of both their advertisers and their viewers/readers. Everyone is now fully aware of how relevant to our early 21st century world is Steve McQueen's movie set in the mid-19th century United States. Lack of truth in advertising instead of racism? In case there were no Chiwetel Ejiofor character posters, could the 12 Years a Slave images of Brad Pitt and Michael Fassbender have been an issue not of racism, but of (lack of) truth in advertising? Needless to say, that possibility has been completely ignored. But see, that wouldn't have generated the outrage and ensuing controversy required to sell 12 Years a Slave – and news articles about the film and its Italian posters – whether in Italy, in Hollywood, or online. Never mind the fact that Brad Pitt is a major worldwide star; one whose World War Z grossed nearly $340 million earlier this year. Michael Fassbender is one of the stars in Quentin Tarantino's Inglourious Basterds (also featuring Pitt), Ridley Scott's Prometheus, and Matthew Vaughn's X-Men: First Class, in addition to Steve McQueen's Shame and David Cronenberg's A Dangerous Method, both of which performed particularly well in Italy. On the other hand, British actor Chiwetel Ejiofor's chief claim to fame outside the U.K. are supporting roles in the Russell Crowe and Denzel Washington star vehicle American Gangster, and in Roland Emmerich's 2012, in which the nominal star was John Cusack and the actual stars were the visual effects. Distributors want to sell their movies. However dishonest their posters and trailers, they'll emphasize whatever or whoever it takes to make an “art” movie – or any movie, for that matter – seem more appetizing to the masses in their respective markets. And this is hardly something new. For instance, back in 1925 independent distributor Astor Company released Ferdinand Pinney Earle's 1921 “art movie” The Rubaiyat of Omar Khayyam as A Lover's Oath. In Earle's original story, the star was English Shakespearean actor Frederick Warde; in Astor's reedited version, the focus was on Mexican-born Hollywood star Ramon Novarro, whose Ben-Hur, released in December 1925, was to become the biggest worldwide blockbuster of the silent era. A Lover's Oath thus became a “Ramon Novarro movie” not because Astor was anti-British (and/or pro-Mexican), but because Novarro's name would help to sell the little art film. British actor Alec Guinness was the one who eventually won a Best Actor Academy Award for his performance in David Lean's 1957 war drama The Bridge on the River Kwai. That movie's poster, however, emphasized American star William Holden, who, though top billed, actually has a secondary role in the film. Anti-British bias? More like pro-box office bias. Kevin Costner in Sizzle Beach U.S.A.
Mel Gibson in Chain Reaction. Keanu Reeves in The Watcher. Michelle Pfeiffer in the mash-up Power Passion Murder. Selena Gomez in Harmony Korine's recent mini-hit Spring Breakers. A post-La Bamba Lou Diamond Phillips in Stand and Deliver, which earned Edward James Olmos a Best Actor Oscar nomination. Shower curtains with movie themes: Bette Davis and Joan Crawford in What Ever Happened to Baby Jane?. Directed by Robert Aldrich, the 1962 psychological drama/suspense thriller What Ever Happened to Baby Jane? stars Best Actress Oscar nominee Bette Davis and fellow Warner Bros. veteran Joan Crawford as two sisters – one an insane former vaudeville child star; the other an invalid former movie star – sharing a decaying Hollywood mansion. Unlike the shower curtain, the film itself is in black and white. Hence, it's impossible to tell how red their lipstick-smeared lips are. Alt Film Guide mostly discusses movies (and sometimes allegedly racist posters). This post segment, however, is about (non-controversial) shower curtains. Don't panic. This December 2013, the Dangerous Minds website posted a link to eBay listings of shower curtains designed by New York City-based artist Glen Hanson. Those aren't your average colorful shower curtains. Instead, they're colorful film- and TV-themed shower curtains. That makes all the difference. Featured are, among others, Bette Davis and Joan Crawford in Robert Aldrich's What Ever Happened to Baby Jane? (1962), Divine in John Water's Pink Flamingos (1972), and a '60s version of Cher (who did star opposite soon-to-be-husband Sonny Bono in William Friedkin's 1967 flick Good Times). Catherine Deneuve and Nino Castelnuovo in Jacques Demy's The Umbrellas of Cherbourg (1964). Jane Fonda in Roger Vadim's Barbarella (1968). Meryl Streep in David Frankel's The Devil Wears Prada (2006). Catherine Deneuve and David Bowie in Tony Scott's The Hunger (1983). 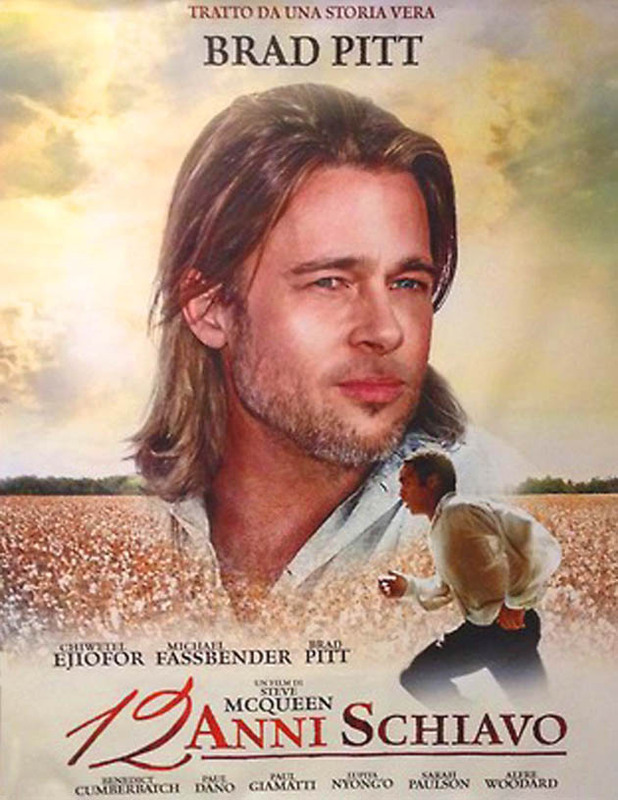 Brad Pitt 12 Years a Slave Italian poster: BIM. “Racist 12 Years a Slave Posters? 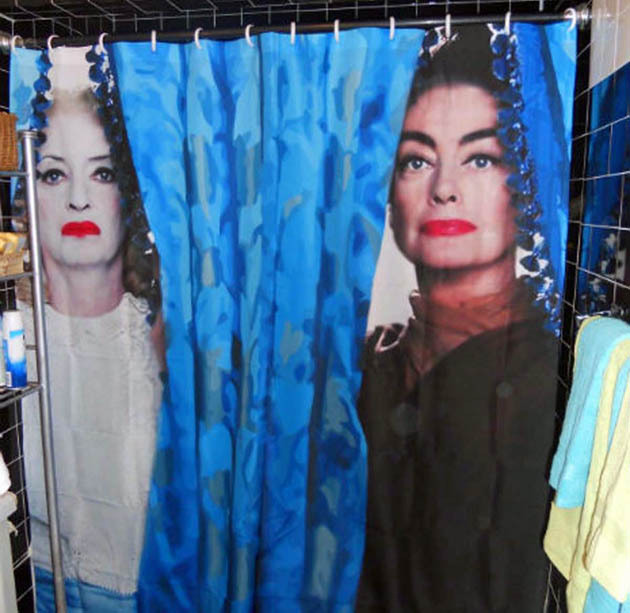 + Bette Davis & Joan Crawford Shower Curtains Are Watching You” last updated in July 2018. As a gay man and a fan of both actresses I think the curtain is brilliant! Where does one purchase this beauty? You made me smile this evening. Very interesting piece. I bought a new shower curtain for my new home a few days ago. I really want the David Bowie/Catherine Deneuve shower curtain from “The Hunger.” We'll see. Still smiling about your article. Very nice, indeed. Oh, is the Janet Leigh aand Tony Perkins shower curtain available? Now that would be a scream. Lol. I understand what Jack is saying, about Chiwetel Ejiofor not really being known in Italy. I'm not sure whether these poster designs amount to racism, or if it's all just a marketing ploy to attract more viewers. Regardless, I'm not sure how Jack can say there is “above all no dishonesty.” At the very least, the posters are misleading. They imply that Brad Pitt and Michael Fassbender are the stars of the movie, when in fact, they play only supporting roles. Really though, it does seem that some racism is in play here. If the point was to show that big stars known to Italy were in the movie, then why not have smaller pictures of all of the main cast members? Instead, there is a giant picture of one of the white supporting actors and below it, a smaller side-view picture of Chiwetel Ejiofor. And yes, Mr. Ejiofor is featured on both posters, but he damn well should be! He was brilliant in this role! He may not be as well known, but he is definitely the real star of this movie! Unfortunately, Chiwetel Ejiofor is not famous like Sidney Poitier, Bill Cosby, Eddie Murphy, Will Smith, Morgan Freeman, Denzel Washington, Whoopi Goldberg, Spike Lee and so on. There is no racism, above all no “dishonesty”. Italians know Brad Pitt and Michael Fassbender, but they don't know Chiwetel Ejiofor. Maybe he's famous in UK and America, but that actor is absolutely unknown in Italy. I mean, he's not a prominent figure in Italy. I have gone to wikipedia, because I wanted to read more about him. Imagine. Anyway, the Italian artist put him on both posters (so, there is: 1 B.Pitt, 1 M.Fassbender, and 2 Ejiofors!). But some journalists (e.g. Ben Child, The Guardian) didn't like the fact that his fellow countryman, Ejiofor, is not considered “a major worldwide star” in Italy. So, to sell more copies of the paper, Ben Child invented the false accusation of racism against Italy.